LONDON (REUTERS) - A bible which once belonged to Elvis Presley and contains his handwritten notes and thoughts has sold for £59,000 at an auction in England, the auction house said. 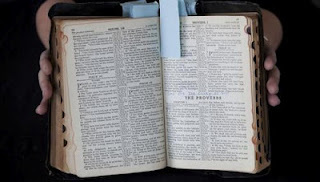 The religious book, used by Presley until his death on Aug 16, 1977, was expected to fetch around £25,000 but went for more than double its value. But a pair of Presley's unwashed and soiled underpants, worn underneath his famous white jumpsuit during a 1977 concert, went unsold.